Location: Yorkshire, England. (O/S SE 319665). 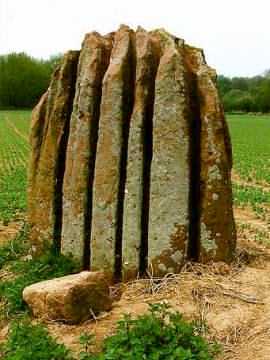 Grid Reference: 54° 5' 33.5" N, 1° 24' 7.6" W.
The Devil's Arrows: (Menhir Alignment). Only three of the original four (possibly five) stones now remain. 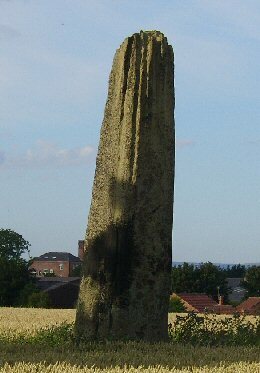 The second largest standing stones in Britain, and bettered in height only by the Rudstone Monument near Scarborough. These stones form an important part of the prehistoric landscape, forming alignments with other sites including several henges as far away as Thornborough complex (called the 'Stonehenge of the North'), and one of the most important prehistoric sites in Northern England. Probably originally a five-stone row. The fourth stone was reputedly broken up in 1582 to build the bridge over the River Tutt, and the fifth is lost in history. The stones are of grit-stone, having pointed tops, with a fluted effect also seen in St Uzec, France, and are buried over 1.5m into the ground. (An excavation of the smallest stone in 1876 revealed a hole 4ft 6in deep and five years later, an excavation of the tallest Arrow showed 6ft of it to be buried in the ground) (1). The three stones from North to South, becoming progressively taller and slimmer. 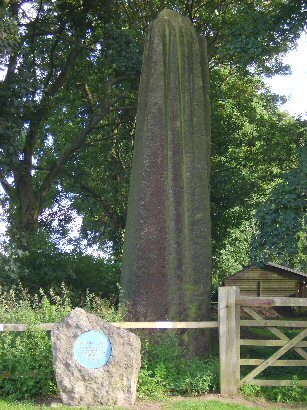 The stones are composed of millstone grit and the likely source is Plumpton Rocks two miles south of Knaresborough where erosion has produced large quantities of individual slabs. The lightest of the Arrows weighs over 25 tons and would have had to be pulled over a distance of some nine miles. Recent experiments (including one televised in 1996 “Secrets of Lost Empires”) have proved the feasibility of moving and erecting such stones without the benefit of modern equipment and technology. 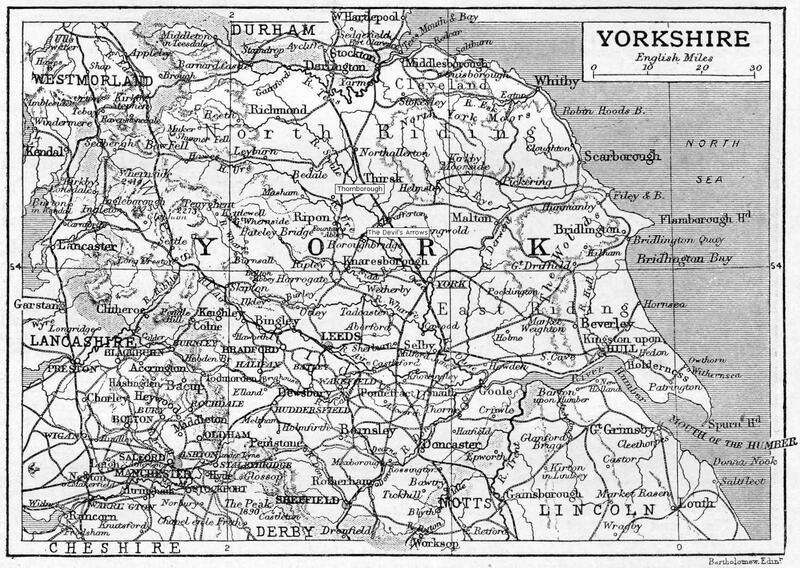 It is estimated that the arduous pull from Plumpton to Boroughbridge would have taken six months. The upper section of the fourth stone is claimed to stand in the grounds of Aldborough Manor and the lower part is believed to form part of the bridge which crosses the River Tutt in St. Helena just a few hundred yards away on the route into the town centre. Large pieces of the same millstone grit have turned up in the garden of a house bordering the field in which the enclosure containing the largest arrow stands. Two large boulders of the same material as the stones have been found in the garden of a house only a hundred yards or so from the line of the stones and may possibly be part of the fourth stone. It is important to highlight that the three stones do not fall into a straight alignment. Having noted an alignment relating to the three Thornborough Circles, one can see that these three henges also share an offset-alignment, as do the nearby henges on Hutton Moor, and a group of three tumuli there also. This 'elbow' alignment between three monuments is seen at several other circles in England, and is often suggested as being related to Orion's Belt. The Devils Arrows are the centre of the most important alignment of standing stones, henges and other remains in Northern England, all running roughly N/S alongside the ancient line of the A1, Stretching from Hutton Moor to Thornborough and beyond. Deveraux, Pennick and others have noted two distinct alignments from the Devil's Arrows. Astronomy - The most likely astronomical alignment is the alignment with the southernmost summer moonrise (1). The stones were the site of a solstice fair in historical times according to Stuckley. 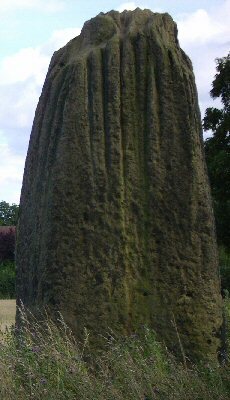 Each of the standing stones has a series of grooves at the top which are disputably thought to have been carved by man (or the result of weathering). 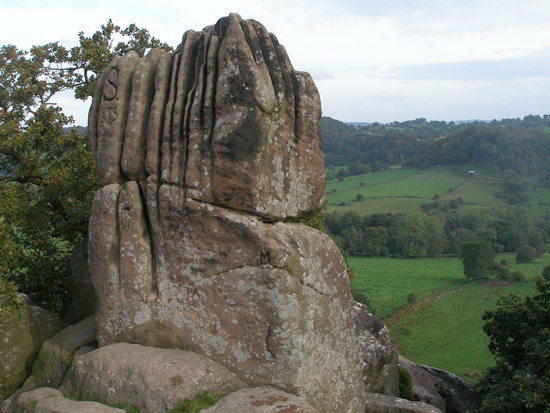 They show no trace of tool working today – and the same grooves of varying lengths can be observed at Plumpton rocks where the stones for the Devil's Arrows are suggested to have originated. The first recorded excavation at the foot of the stones was in 1709 when a 9ft area around the central stone was opened. This revealed that, just below the topsoil, cobbles, grit and clay had been packed around the stone to a depth of 5ft. The base of the stone had been dressed by pointed tools to produce a smooth bottom which sat squarely on the hard packed clay beneath. 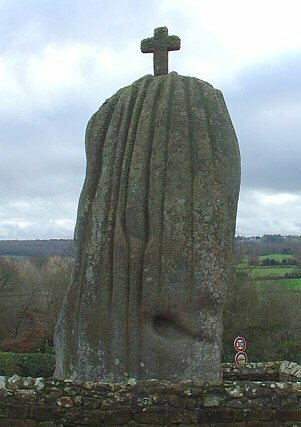 Menhir de St. Uzec, Brittany, France. Near the end of the 17th century a cross was installed, and the section below it was carved (on the other side), with the representations of the instruments associated with the passion of Christ, including a ladder and a lance. There is/was also a painting of the crucifixion on the menhir that had to be frequently retouched because of the high moisture content in Brittany. 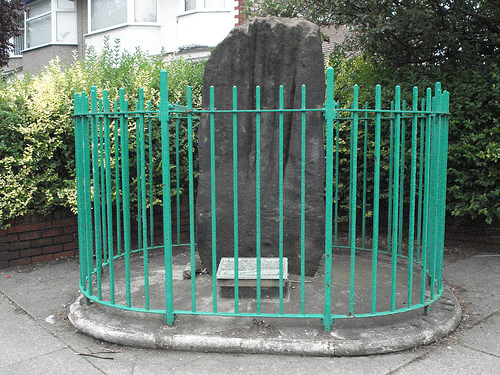 The Robin Hood's Stone is reputed to be from the Calderstones chambered tomb (In 1964 the six stones were moved to their present site in the Harthill Greenhouse in Calderstones Park where they were erected in random order). It now stands in iron railings on the junction of Booker Avenue and Archerfield road in Allerton at SJ399863. 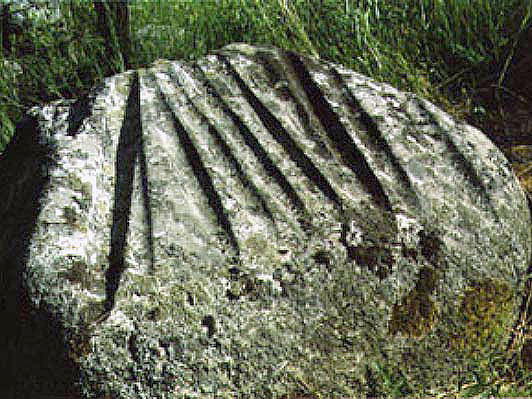 This stone has a number of grooves on it similar to The Calderstones, and an old photograph from Watkin's 'Ley Hunters Manual' shows cup-marks on the end now buried. Before its present siting in August 1928, the stone stood in a nearby field known as Stone Hey. The stone was moved when the site was to be built over. A plaque on the base of the stone records the bearing from its present position to its former site; 198 feet at a bearing of 7 degrees east of true north. Gallery of Images: The Devil's Arrows. 2). A. Watkins. The Ley Hunters Manual. 1989. Aquarian Press.